Push the envelope with autonomous freight trains? 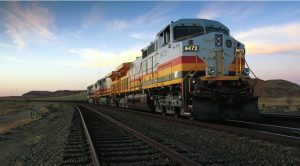 According to the most recent earnings reports, North American Class I railroads are producing record-low operating ratios and posting record-setting earnings. These results strongly suggest that the current operating format of two-person train crews utilizing innovative safety and fuel conservation technologies is helping achieve these desired, value-added financial results. In short, it is possible for innovative technology and human-operated freight trains to exist in a complimentary fashion. The combination is currently working quite well.